Our online booking is currently not operational, please call 480 217 1635 for scheduling information and to book a ride. Please note when booking a ride, the Time/Date/Location listed specifies the start time of our morning or afternoon flight sessions. The end time of a session depends on the number of rides scheduled for that session. Plan to arrive early at the start of either the morning or afternoon session that you are booked for. Our safety briefings begin promptly at the start of the sessions. During the session, rides will be given first-come first-served. BEFORE BOOKING A RIDE ONLINE, CHECK OUR UPCOMING EVENT SCHEDULE HERE. Verify your desired ride has not been subject to change or cancellation without prior notice. AAHF is extending its outreach to Southern California by stationing AH-1F Cobra helicopter #15589 at YANKS Air Museum at Chino Airport this summer. 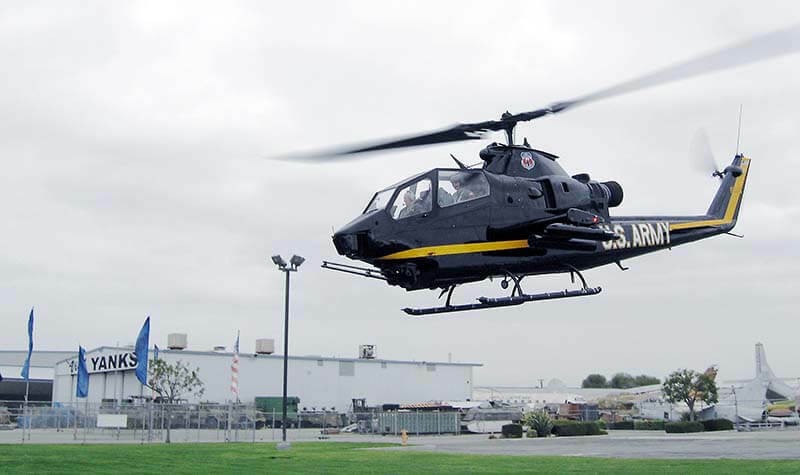 This stationing is on a trial basis and continued stationing of this Cobra and other AAHF assets will depend on the support and from the Southern California Aviation Community. The Army Aviation Heritage Foundation (AAHF) tells the U.S. Army Aviation story by hosting and participating in Aircraft and Museum Tours, School Programs, Air Shows and other public events across the country. Our “Sky Soldiers” along with dedicated volunteers conduct patriotic flying presentations, public helicopter rides, educational presentations and more.